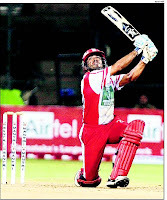 A furious start by wicketkeeper-batsman Rohit Sabharwal and a heady ending by off-spinning allrounder Udit Patel were the features of Mangalore Uniteds comfortable 13-run win over Team Shimoga in a Mantri KPL tie at the Chinnaswamy Stadium on Tuesday night. Having posted a healthy 135 from the allotted 17 overs, the innings being interrupted by a moderate shower after the 11th over, the target was boosted to 140 based on the VJD method. The match o f f i c i a l s neednt have bothered as Shimoga fell well short, mainly due to a terrible start that saw them four down for 18 at one stage. In floodlit matches, it is almost given that the captain winning the toss will bat first and Tuesday was no exception , Bharat Chipli calling right and opting to bat. Chipli, who has had a mixed tournament , fell early, but Sabharwal (52, 39b, 7x4, 2x6) was on hand to do some serious damage to the Shimoga bowling. The right-handed opener reserved his best for after the rain-break , the over on resumption going for 23 runs. SL Akshay was the bowler to suffer as Sabharwal went berserk, the sequence reading 6,4,4,4,1,4, the last boundary being hit by R Jonathan. Once Sabharwal fell, Patel (33 not out, 18b, 1x4, 3x6) took over, the second of his three sixes being one of the tournaments biggest. That it came against a fellow offie, Shimoga skipper Ryan Ninan, would have given Patel an extra high. Soon after that it was time for high-fives all round as the Shimoga innings failed to take off. Three wickets in the first two overs meant that the chase was over before it could begin. SL Akshay did contribute a 36-ball 41 (2x4, 1x6) but he was always fighting a losing battle as was A Mithun (34 not out, 19b, 3x4, 2x6), who with 34 needed off the last over bowled by S Arvind, managed as much as 20 runs.